Augusta in April. It’s an event which epitomises tradition. The drive up Magnolia Lane. The Par 3 competition. The Champions Dinner. Patrons. Amen Corner. Rae’s Creek. The Butler Cabin. The Green Jacket. It also has more than its fair share of quirky rules and regulations but in a sporting world that is ever changing, The Masters appears to me, to be more popular than ever. and the Golden Bear still holds the record for most victories (Tiger Woods and Arnold Palmer are tied for second with four Green Jackets each). It’s the first golf major of each season and it’s my favourite tournament despite growing up in a country where The Open Championship is the one to watch on a links course each July. 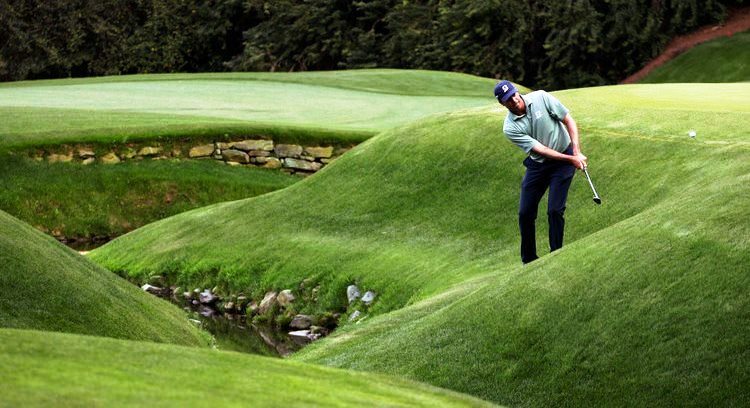 With the US Open and PGA Championship also rotating between different courses, the advantage The Masters has is familiarity, which the players and viewers love. One aspect of the tournament that has (thankfully) developed over the years is the level of tv coverage permitted. It’s amazing to think that until 2002, there was no coverage of the front nine holes over the four days. Less is more was the reasoning; that feeling of exclusivity. That year, they allowed front nine coverage of the leaders in the final round. In 2006, ‘Amen Corner Live’ provided a live feed of the 11th, 12th and 13rd hole, a feature which still exists and will be available on a Sky Sport pop-up channel this week (with another pop-up channel showing live coverage of featured playing groups). Despite their stuffiness in some respects, the Augusta National has also embraced technology via their website, app development and YouTube channel, where you can watch the last 51 final round broadcasts in full. In another sign of progression, last week saw the inaugural Augusta National Women’s Amateur tournament. In an unusual structure, the 72 players played the first two rounds at Champions Retreat, 15 miles north of the course we all know. Then, after the first two rounds all players played a practice round at Augusta (so they got a taste of it), with those making the cut also playing the third and final round there. Jennifer Kupcho won by four strokes at a club which did even admit female members until 2012. Looking ahead, this year’s edition is as wide open as ever. Below I’ve highlighted some of the players I expect to be in contention on Monday morning NZ time. Before tying for 15th last year, Casey had finished 6th, 4th & 6th between 2015 and 2017. His last round there was a cracker, shooting a 65; bogeys on 17 & 18 cost him a share of Nick Price and Greg Norman’s course record. Casey enjoys the challenge and is confident of his chances, saying ‘I have the game that suits it and I like the questions that it asks.’ A winner on the PGA Tour three weeks ago at the Valspar Championship, the World No 11 has form, experience and confidence; a decent mix around Augusta. Tiger sits one place behind Casey in the World Rankings after making the quarter finals of the World Golf Championship Match Play a fortnight ago. He answered a lot of doubters last September when winning the Tour Championship, but the fact remains he hasn’t won a Major since 2008 and the last of his Green Jackets came in 2005; that’s despite the fact he’s had three top 3 and seven top 10 finishes at Augusta since his last victory there. Although his accuracy off the tee has never been his main strength, he’s averaged 46th in that accuracy measure in his last seven Masters appearances. A good week with the driver and he will be there or thereabouts. Rory catapulted himself back onto the top step of the podium at the Players Championship on St Patrick’s Day following a year without a win. Now 29, the World No 3’s last major was at 2014’s PGA Championship and the Masters remains the missing piece of the Grand Slam puzzle. The issue isn’t McIlroy’s talent, it’s putting four rounds together when it matters most. His meltdown in 2011 when he shot an 80 in the final round (having led by 4 strokes overnight) is well behind him mentally, but it will always be talked about until he wins it. Rory has been excellent off the tee in 2019 and his approach play has also been superb, both important elements at Augusta. When will the wait for the elusive major end for Fowler? Second by a stroke last year to Patrick Reed, Fowler won the Phoenix Open in February in dogged fashion; seemingly cruising to victory on the final day, he made a triple bogey at the 11th before recovering to make two late birdies and win by two. Putting is a huge strength for the World No 9 and if he can give himself plenty of birdie opportunities and not have to worry too much about saving pars, he’ll be up there. Johnson and Justin Rose have been flip flopping the title of World No 1 recently and Johnson has slipped back to second place this week. With two victories this year, including a dominant five stroke victory in February’s World Golf Championship event in Mexico, he goes to Augusta with a great chance of adding to his only Major in the 2016 US Open. He’s been placed in the top ten in his last three Masters appearances (he missed 2017 through injury). As odd as it sounds, he’s flown somewhat under the radar coming into this week. He has a great all round game and it would surprise few if Patrick Reed is slipping a new jacket over him after 72 holes. I’m expecting another four days of high quality golf and plenty of twists and turns for the neutral. I’m picking Rory to hold it together and complete his Grand Slam this time around. One thing is for sure at Augusta though; the winner, whoever it is, will be a worthy one.